The trade deadline isn’t until the end of the month, but enterprising contenders are already making the rounds and looking to pick the carcasses of teams less fortunate. Every extra start or at-bat that the contender can get out of the fresh meat is a start or at-bat in their favor, so they might as well get going. Fantasy owners might take note here and get ahead of the eight ball themselves. The danger in AL- and NL-only leagues is that a fantasy owner’s player gets traded out of their league and creates a hole on their roster. Another danger is that a player moves from a beneficial situation to one less supportive of their skills. Let’s run down the top ten trade targets in the rumors currently and talk a little about where they might land and what that would mean. We’ll handle the pitchers today, and the hitters early next week. Lee owners in AL-only leagues should be shopping him as hard as they can. Some might even counsel that Lee owners should take whatever they can get, perhaps from a team in the bottom half of the table looking for a home-run shot. Apparently Lee has told his teammates he’s already made his last start for the Mariners (and then he promptly denied it in the media). The worst news is that many of the most-rumored spots for Lee are in the National League. The Mets, Phillies and Cardinals have all been linked to the lefty with the insane strikeout-to-walk ratio (just look at the Bloomberg Sports Fantasy Tools spider graphs and see how pretty his work has been). Lee owners might take heart that the Yankees and Twins have also been included in the rumors. Even though the source might be a little old, Geoff Baker of the Seattle Times said on June 24th that the Mets and Twins were the favorites to land Lee, and that seems to make the most sense. The thing is, the Twins aren’t known for making big trade deadline pickups, as the lede in this MLB.com article about the Orlando Cabrera pickup states. That kind of move seems more up embattled Mets’ GM Omar Minaya’s alley. Keep Lee in an AL-only league at your own peril. Millwood is actually second-most likely starting pitcher to be traded to Lee. Because of his advanced age (35), rough ERA (5.40), expiring contract, and the Orioles’ record (24-54), if anyone wants him they can probably get him. The thing is, he’s sporting his best strikeout rate since the last time he was in the National League (7.00 K/9) and a walk rate that is right in line with his career number (2.78 BB/9). He’s giving up a few too many home runs (1.69 HR/9), and that’s will happen to a flyball pitcher (42.9% GB% career) in the AL in a tough park for pitchers (1.283 park factor for home runs). Given his nice underlying statistics, and his success in the NL in the past, Millwood is less of a loss for AL-only owners and more of a potential pickup for NL-only owners. He’s not someone to bust your FAAB budget on, but he’s certainly worth some money, especially if he ends up in a park that suppresses home runs like Citi Field (.595 park factor for home runs) or Busch Stadium (.763 park factor for home runs). The sharks circling Houston are a little less rabid despite the obvious state of that carcass, but that’s perhaps justified in the case of Oswalt. He is due $16 million next year and has a $2 million buyout in 2012. That’s a lot of money for a pitcher that is 32 going on 33, never had an elite strikeout rate, and has a body type that some feel doesn’t age well. On the other hand, Oswalt is showing the second-best strikeout rate of his career and is pitching the best he has in about four years. Because of the money, he’s a little less likely to change hands. Even with owner Drayton McLane saying he would eat some of Oswalt’s salary, the only team linked to the pitcher so far has been the Rangers. That’s a bit ironic, considering their financial situation. It’s also worrisome to NL-only Oswalt owners. The Cubs aren’t used to being sellers, but they are 10.5 games out, 11 games under .500, and have a -24 run differential. They don’t look good. Many of their problem players have salaries that are too onerous to trade – no team will want to take on the rest of the Alfonso Soriano or Carlos Zambrano contracts, for example – but then there’s Ted Lilly. We talked about Lilly as a fantasy hold – his velocity is returning, and he’s showing a nice ERA – but his strikeout rate is still lagging, and he’s still an extreme fly ball pitcher. Look at the difference between his xFIP (4.60) (expected Fielding Independent Pitching, a number that strips out batted ball and home run luck to produce a figure on the ERA scale) and ERA (3.12). If the Cubs are smart enough to sell, they’ll get some interest in Lilly, but the trade rumors have been light so far. GM Jim Hendry might give the team as long as he can before selling a piece like Lilly, so fantasy managers should probably take the same approach. Though the Diamondbacks are obviously cleaning house, the feeling is that the team would have to be ‘overwhelmed’ to trade their ace. First of all, it might be selling low, because despite secondary statistics in line with his career rates (8.90 2010 K/9, 7.71 career K/9; 1.70 2010 BB/9, 1.96 career BB/9; 41% 2010 GB%, 44.1% career GB%), his ERA is not pretty (4.56). Secondly, he only costs about $33.75 million from 2010 until 2012 according to Cot’s Contracts. It wouldn’t make much sense to trade an underpaid ace at a lowpoint in his value. It’s much more likely that the team trades some of its veteran position players. The Indians are terrible (31-47), and Carmona is cheap ($11.375 million combined 2010/2011), but it will be interesting to see how much teams will want to pay for his services. He relies very heavily on his sinker-inducing ways (58.6 GB% this year, 60.8% career). When his control eludes him (3.16 BB/9 this year, 3.78 career), he can be terrible. But right now, despite his inability to strike people out (4.73 K/9), he’s doing well enough to elicit interest (3.68 ERA, 1.28 WHIP). On the other hand, named suitors don’t abound (the Mets “aren’t interested‘ according to Joel Sherman), and his fantasy trade value is hard to gauge. Carmona may be one of those players that fantasy managers are happy to have owned when he was going well. This group may include the most-dealt pitchers on the list, as relievers cost less in both contracts and salary. They also are perceived as difference-makers for contending teams with poor bullpens, rightly or wrongly. Heath Bell tops the list, as his Bloomberg Sports Fantasy Tools spider chart shows. His owners should be slightly nervous, as rookie GM Jed Hoyer is talking about adding offense, and has two ready-made replacements in Mike Adams and Luke Gregerson, but as long as the team is going well, Bell should remain in San Diega. Kevin Gregg, on the other hand, might change hands if someone wants him. Toronto isn’t going to the postseason, and they also own Jason Frasor and Scott Downs, so teams needing bullpen help will be calling. The thing is, Frasor and Downs have been pitching better and are free agents at the end of the year. They might be preferable to contending teams, and with Gregg’s bloated ERA (4.20) and walk rate (5.40), he could just stay in Toronto. David Aardsma is struggling (5.33 ERA), and is also cheap (arbitration-eligible for three more years), so he’ll probably stay in town despite the odd rumor. If he does leave, it’s Brandon League that will take over. Octavio Dotel has surpassed expectations and is obviously not in the long-term plans for the Pirates, so his owners should be worried. Suitors are not yet obvious, though, and his perceived value is probably not too high. His owners could shop him to saves-starved teams to be ahead of a possible trade, on the other hand. 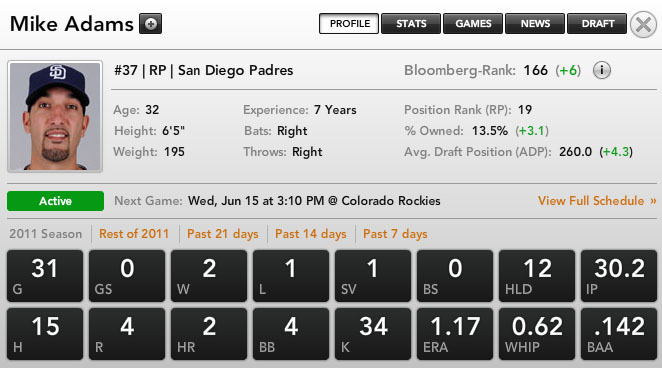 For more on Cliff Lee and other possible trade-deadline movers, check out Bloomberg Sports’ Fantasy Tools.